HideIPVPN is easy to use, but its performance leaves a lot to be desired. Editor’s Note: This review was updated on November 7, 2018 to reflect changes to the HideIPVPN desktop app for Windows, improved speed scores, and a change to the review score. Picking a VPN is a tricky business since you don’t really know what you’re going to get until you buy. That’s why some services offer free trials. 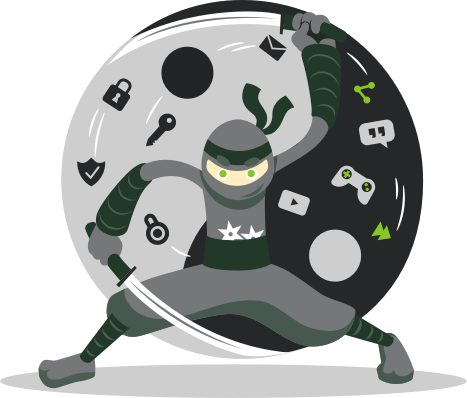 HideIPVPN is one such company that offers a 24-hour free trial with full access to its entire service. After taking a second look at HideIPVPN, what I found was a much improved VPN service that has better speeds and a brand-new look. HideIPVPN is still a fairly basic service. You won’t find much in the way of extra features. It has DNS leak protection, which is turned off by default, and there’s also an “Application Killer” that tells the VPN to stop specific desktop programs if your VPN connection drops. Other VPN services kill the PC’s entire internet connection when the VPN drops, but killing specific programs may be more useful to some. HideIPVPN with an active connection. The new VPN desktop program is reminiscent of ExpressVPN. To get online just click the big Connect button in the center of the interface. 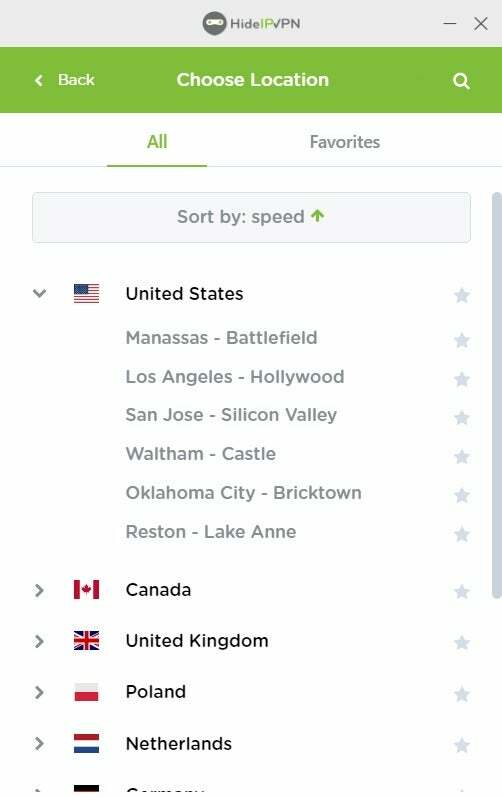 If you want to specify the country you’d like to connect to, click the Choose Location button to get a list of all country locations sorted by speed. There’s also a Favorites section if you’d like to save specific locations. 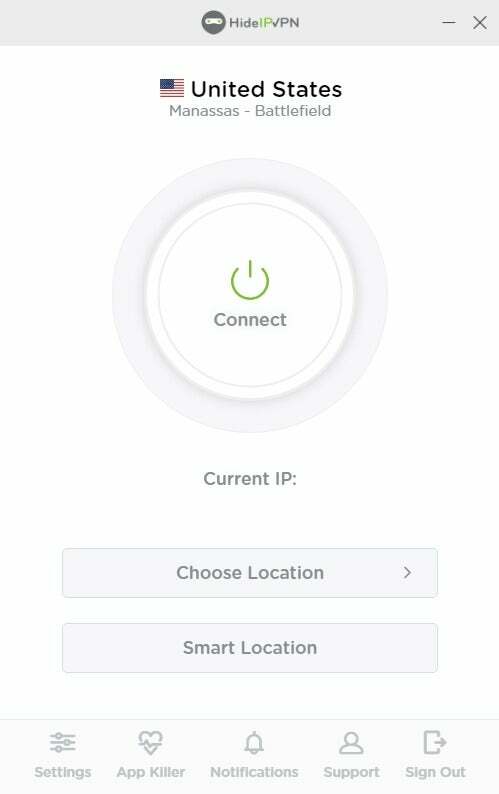 If speed is your focus, then instead of specifying the location you can use HideIPVPN’s Smart Location feature, which connects to the fastest server for you at the time. By default, HideIPVPN starts with an SSTP connection, which is fine, but most users should opt for OpenVPN instead. 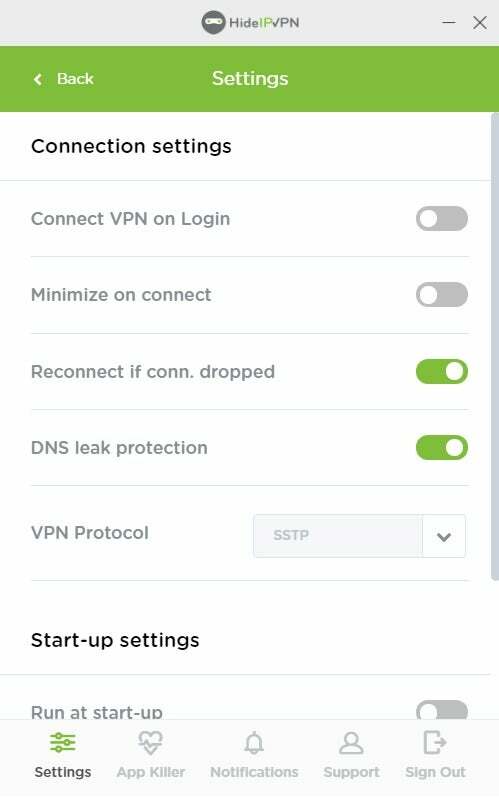 You can change the default protocol by going to Settings > Connection Settings > VPN Protocol. Compared to other services, HideIPVPN doesn’t offer a lot of choice for connections but it’s still serviceable and is improved over its previous listing. There are now 29 servers in 11 countries. That’s not a lot, but if you need a VPN in the United States or Europe it’ll get the job done. HideIPVPN has only one server in Asia, which is in Singapore. As for pricing, HideIPVPN uses a very unusual pricing scheme compared to its competitors. For a $70 annual fee you can get the usual VPN service with access to all of HideIPVPN’s servers. Otherwise, you can pay $40 per year to get access to one specific country such as the U.S., Germany, or Poland. There’s also a BitTorrent-only service where you can use eight different VPN servers for file-sharing. There’s also a Smart DNS-only service for $38.95. HideIPVPN allows you to use its service on up to three devices simultaneously on the same account, which is lower than the norm of five. There are apps for Windows, Mac, Android, and iOS. This is where HideIPVPN fell apart last time but is much better now. Overall, HideIPVPN speeds were just 31 percent of the base speed, on average. That’s not outstanding, but much better than the basement dwelling 16 percent we saw last time. For most people, these speeds should be good enough, with strikingly good speeds in Germany and the UK. The company now lists the team behind HideIPVPN on its site, which is another marked improvement over last time. HideIPVPN’s CEO is Moldova-based Adrian Crismaru. Technically, however, the company is based in the United States. HideIPVPN does not advertise its business location on its website, but when I asked a company representative for this information, I was given a company address of registration: 1201 N Orange St. Suite 700 Wilmington, Delaware. As for its policies, the company does have statements in its terms of service that some users may not like. At the time of this review, the terms of service said, “HideIPVPN will not, in normal practice, monitor the communications of its clients to ensure that they comply with HideIPVPN policy or applicable law. When HideIPVPN becomes aware of harmful activities, however, it may take any action to stop the harmful activity.” Presumably, this language is to prevent spammers from abusing their system. As for payments, HideIPVPN takes credit cards, PayPal, and Bitcoin. That allows for varying degrees of anonymity and is pretty standard in the VPN world. Once you’re done paying for your account, HideIPVPN emails you a set of login details for the VPN that includes a randomized username and password. You also create a different set of credentials to log in to the website using your email address and a password. It’s a little confusing to have two sets of login details, but a few other VPNs do this as well. Overall, HideIPVPN has moved from “wouldn’t recommend” to “recommendable.” The price is about the same as most VPNs, though a shorter list of servers and country locations may turn off some users. It also doesn’t allow for five simultaneous connections, which is the norm. HideIPVPN is a very easy-to-use service and the speeds are fine, but it lacks a variety of server and country choices, and the amount of simultaneous connections is lower than most services.